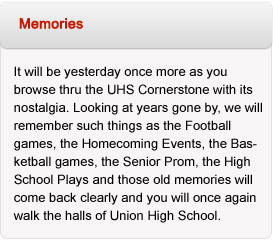 Union High School graduates have created a Memorial Fund in Memory of Union High School. This fund has been set up under Monroe County Educational Foundation. The foundation invests and administers the funds using distributions to award a scholarship each year to a deserving citizen in Monroe County to assist in pursuing higher education. You can make a charitable donation to this fund or receive more information by contacting Dr. Holly Harvey by email at: drsharvey@gmail.com Make sure that you specify that your donation be given to the Union High School fund.